Jenny is the odd one out in her family. They are all physically adept and athletic, while Jenny is clumsy and uncoordinated. Jenny isn't sure where her talents lie, but it may be in art, if she can ever finish a painting. But even if it is, her family couldn't care less. But there is more: Jenny is the offspring of a sperm donor and only a half-sibling to her brother and sisters. 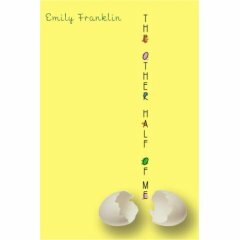 Feeling not only like an outsider, but also as if she is missing a half, she searches for (and finds) a half-sister (from the same donor). But meeting her half-sister has a complicated impact on her family and herself. An interesting premise with some nuanced understanding of human interaction, but the parents go from clue-less to caring far too easily for me and everything wraps up too neatly. The conflicts are set up a bit too artificially and fall away without a struggle. Without any tension and a minimum of character evolution, this is a functional story, but no more.